Kick off your summer with April’s five enticing and enchanting color books. Memorial Day was originally called Decoration Day because loved ones would decorate the graves to remember those who died while serving the United States of America. Not only is it a day to remember but it is a day to decorate and embellish our own lives. The beginning of summer is magnified through patterns and colors resembling vacations to the beach, fireworks, parades, and family. Aquatic trellises and shimmering Greek keys provide a gateway to splash in the water as you celebrate while ancient ruin inspired designs make you want to kick back in the sand soaking in the sun. Geometrical blasts and popping color draw you into their illusions as if you are watching flames light up the night sky. Luxurious historical patterns from Spanish architectural influence dazzle you like decorations covering the uniforms of veterans in a parade. 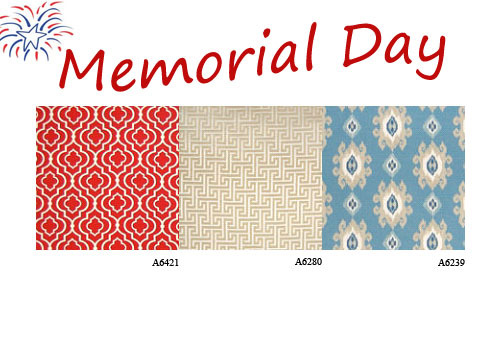 These fabrics and colors exemplify a time to remember, as well as, a celebratory start to the bright summer that lies ahead.